Shares in emerging cobalt play, Celsius Resources (ASX: CLA), doubled in the first six weeks of 2017, hitting a high of 4.3 cents in mid-February. While they held this level until the end of February, there has been a retracement in March which may represent a buying opportunity given that news flow from upcoming drilling could be a share price catalyst. 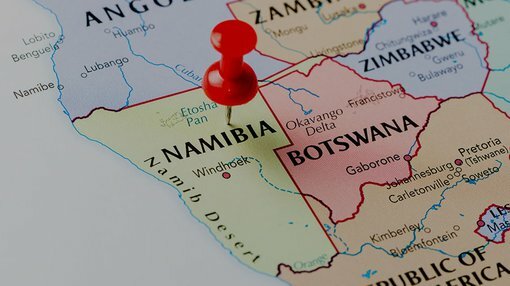 The company announced on Monday that a drilling rig had been mobilised in advance of the company commencing an exploration program at its Opuwo cobalt project located in north-western Namibia, approximately 800 kilometres by road from the capital, Windhoek, and a similar distance from the Port at Walvis Bay. There are good quality bitumen roads connecting both destinations and with the regional capital of Opuwo only 30 kilometres to the south, services such as accommodation, fuel, supplies, air transport and medical services are readily available. The project’s power requirements can be met by the Ruacana hydropower station which supplies the majority of Namibia’s power. 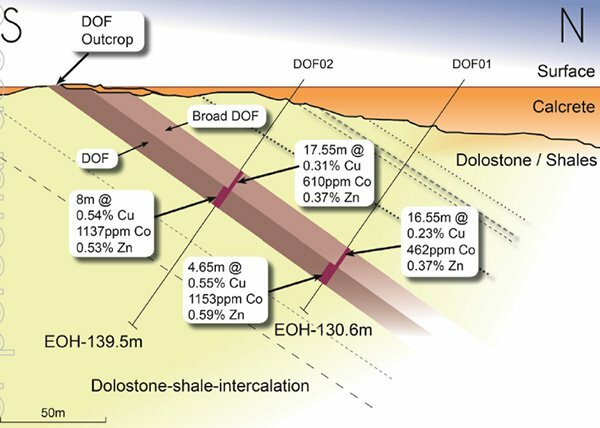 While there has been significant surface exploration by previous explorers, management recently highlighted the fact that only seven drill holes have tested the Dolomite Ore Formation (DOF) horizon, and only two of those holes were assayed for cobalt with promising results of 8 metres at 1137 ppm cobalt and 4.65 metres at 1153 ppm cobalt. 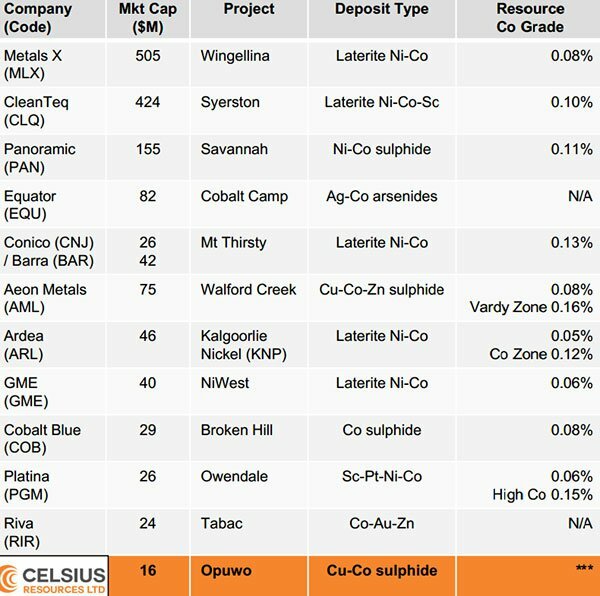 While insufficient drilling has been conducted at Opuwo to define a mineral resource, and it is not certain that further drilling will result in a mineral resource being defined, the following comparison with other ASX listed players provides a guide in terms of weighing up Opuwo’s drill intersections of 0.11% cobalt with resource grades defined by its peers. There is a school of thought that mineralisation in the DOF may share similarities in style (and probably age) to that in the Lufilian associated deposits of the Central African Copperbelt and the Damaran associated deposits in the Kalahari Copperbelt, suggesting there could be an increased focus on northern Namibia, particularly given its more stable political environment as opposed to the Democratic Republic of the Congo (DRC), currently the major global source of cobalt. The following highlights geological features and results from limited drilling to date. The Opuwo deposit has a significant prospective mineralised horizon with an approximate strike length of 30 kilometres, indicating there is the potential for the deposit to contain large-scale sediment hosted copper cobalt mineralisation. This link provides details of the Opuwo acquisition terms which have only recently been completed, along with an extensive outline of the project. The following is a snapshot of management’s rationale for targeting cobalt in Namibia, as well as its strategic goals in terms of exploring the Opuwo project. The spike in the cobalt price started towards the end of 2016, and while the sharp increase of 50% could have some investors feeling that further upside is limited, the forward supply demand curve definitely doesn’t suggest that this is the case. 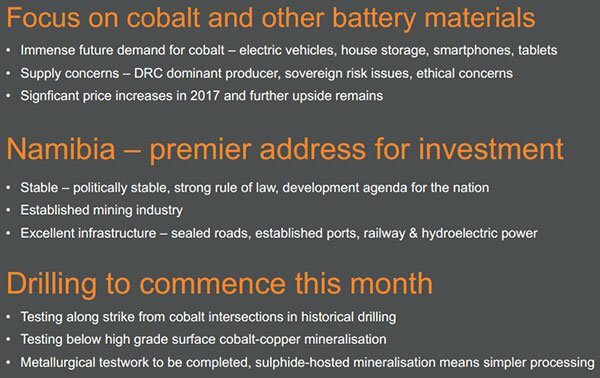 Analysts at Macquarie believe 2017 could be cobalt’s year as it takes over from lithium as the go-to power storage mineral. The broker recently cited increased demand from the core portable electronics sector as recovering while supply growth was relatively stagnant. Macquarie noted that China has next to no domestic mine supply and is highly reliant on the Democratic Republic of the Congo where political events have a history of disrupting mining projects.